Deliveries of the new TX have now begun in earnest with hundreds due to hit London streets in the coming months​. It’s a landmark day for London and its thousands of taxi drivers and passengers as the very first all-new electric TX taxi from the London EV Company (LEVC) has been handed over to a very eager and excited cabbie. David Harris, 46, from Chingford in north East London has been a black cab driver for 21 years and was one of the first to put down a deposit for the new electric taxi when order books opened back in the summer of 2017. Prior to being a cabbie, Harris was a professional tennis player, spending 40 weeks of the year travelling the world. These days, he tours the streets of London and in the new TX will be doing so in unrivalled comfort. As will his passengers thanks to class-leading wheelchair accessibility and features such as on-board wifi, phone/laptop charging, a much more spacious cabin with six seats, wide opening rear hinged doors, contactless card machines and an expansive panoramic roof. Taking delivery of his new TX at LEVC’s Brewery Road headquarters Harris was delighted to receive the keys to the world’s cleanest, most advanced taxi ever, a revolution in the taxi market offering zero emissions motoring thanks to eCity technology comprising of an advanced battery electric powertrain with a small back-up petrol generator that gives a total range of up to 400 miles including 80 miles pure electric driving. 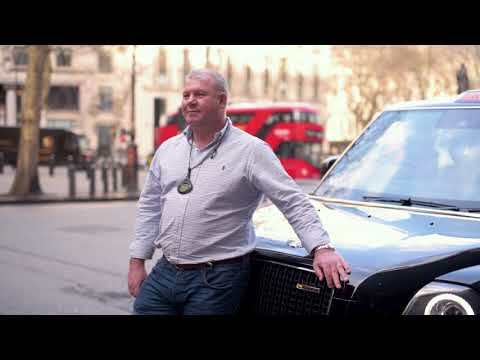 Covering the whole of London and generally starting his shifts at midnight, Harris expects to save £500-£600 a month by switching over from his current diesel cab to the new electric TX, in fuel savings, servicing and overall running costs. An EV advocate, even though Harris can’t charge his TX at home, as he doesn’t have off-street parking, he won’t be letting that put him off as he’ll incorporate a top-up charge into his daily visit to Heathrow, as the airport features a number of dedicated rapid chargers for electric taxis. Unlike the previous taxi, the vehicle’s multi-filter system works to remove gases and particles from the incoming air. In addition, an in-built air quality sensor also automatically closes the external air intake if it detects increased levels of pollution in the outside air – protecting passengers, and the driver, from the capital’s often poor-quality air. World-class active and passive safety systems will help to protect both the vehicle and other road users too. These include forward collision warnings, autonomous emergency breaking and emergency brake assistance, while the TX combines an extremely strong, rigid aluminium body shell with crash protection to the highest international standards, reinforcing the black cab trade’s reputation for safety.